Local Food Marketplace provides a software platform for food hubs that allows them to reach customers, aggregate production and compete with traditional distribution. McCann says her personal experience working in the food hub environment helps her offer more than just tech support to her customers. 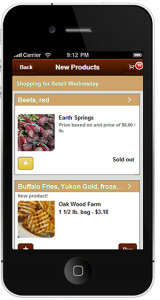 The software was originally designed for McCann and fellow co-founder Doug Frazier’s food hub, Eugene Local Foods. After handing the food hub over to another non-profit, Frazier and McCann used their technology to launch Local Food Marketplace. With steady growth over the last few years, over 70 food hubs now employ the software. McCann notes that for many food hub startups, technology and the world of online marketing can be more than a little intimidating. By creating custom branded software for their clients, she says Local Food Marketplace reduces the stress many feel trying to integrate rapidly changing technology into their business. Local Food Marketplace’s basic product and services consists of a customized software platform and month-to-month support. The platform covers the infrastructure needs of the typical food hub from inventory lists, delivery routes and custom price lists, to storing customer favorites, creating weekly and monthly reports and sending mobile customer alerts. Local Food Marketplace starts by creating a custom-branded software package and integrated website for the food hub, and then trains the staff through individual online webinars to use the product successfully. After the initial set-up is complete, the Local Food Marketplace team is available for additional training, technology updates and general customer support. They provide an online community for their customers where they can exchange ideas and share their successes. Over half of Local Food Marketplace’s customers are now taking advantage of their recent innovation: a mobile food hub app that quickly connects the food hub to their suppliers and customers. The white label app, designed by McCann, can be branded for each individual customer, allowing for mobile ordering and inventory updates, and clients can market both their food hub and the app online, increasing their visibility and sales. This custom technology from Local Food Marketplace has an initial set-up cost in the $500 to $1500 price range, with a monthly subscription fee of 1.5 to 3 percent of monthly sales. The setup fee can be paid over a 12-month period to help manage costs for startups, and technology grants can help with the purchase of the product. Local Food Marketplace believes its ongoing customer service is at the core of their company’s success. “What we do is pretty straightforward, and just helps the food hub run its business by providing all the background infrastructure for them to do that,” says McCann. As well as catering to food hubs, Local Food Marketplace provides technology services to online markets, buying clubs, local food distributors and individual producers. In addition to ongoing technical support for their customers, the company is constantly working on new features and updates to their software package. This fall will see the release of their latest product, predictive software to forecast crop production and secure markets before the seeds are even in the ground.